These cookies are the BEST thing I have ever made! They are chewy, yet crispy on the edges – especially when you allow them to bake the entire 15 minutes per batch. They taste like fall, the orange and the cinnamon, then the hint of chocolate – and nuts- the finish is the pumpkin flavor, very subtle and they even have fiber because I have modernized this recipe so it includes almond flour and oats. If you are wanting gluten free, try it with specialty flours, just be sure the cookie dough is the correct consistently – I was able to achieve this by adding rolled oats. Your kitchen will smell heavenly! 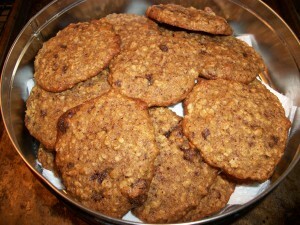 Mix and sift flour, salt, baking powder and soda, stir in oats and set aside. Mix “wet” ingredients in a mixing bowl. 1 teaspoon orange peel, grated. Cream the sugars with the butter and spices, beat in the egg. Add flour mixture alternately with pumpkin until thoroughly blended. Stir in chocolate chunks, nuts and orange peel. Drop by Tablespoon on greased cookie sheets. Bake in preheated oven at 375 degrees F for about 15 minutes. Makes about 4 dozen cookies.